The Nex Flow™ Air Edger™ Flat Jet Nozzle, provides a powerful force “flat” air profile while reducing compressed air use for a variety of blow off applications. The unit is 2” wide and the gap is maintained by a shim. Changing or stacking various shim sizes allows you to set the force that you need for any particular application – from a light blow off to a powerful blow off force. Laboratory tests show not all “flat” jets actually produce a true flat profile. 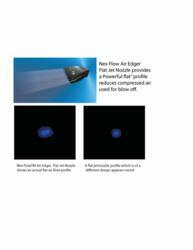 The Nex Flow™ Air Edger™ Flat Jet Nozzle, actually does because of its technically advanced design. The Nex Flow™ Air Edger™ Flat Jet Nozzle is easy to mount and maintain, reducing both compressed air consumption and noise levels. The Nex Flow™ Air Edger™ Flat Jet Nozzle works by producing a laminar flow of air along its 2” length using the “Coanda” effect which entrains a large volume of air from the surrounding area along with a small amount of compressed air from the Air Edger™ Flat Jet Nozzle itself to produce an amplified output flow. Made of cast zinc aluminum it is a rugged unit applicable for many applications. Units may be placed side by side to provide an efficient and strong blowing force over wide lengths.